Tiklé Gyachen (Tib. བླ་སྒྲུབ་ཐིག་ལེའི་རྒྱ་ཅན་, Wyl. 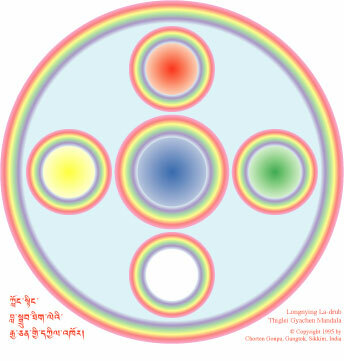 bla sgrub thig le’i rgya can), The Sealed Quintessence — the innermost secret lama practice in the Longchen Nyingtik cycle. This is considered an indispensable preliminary to Dzogchen practice. Jikmé Lingpa's revelation only consisted of the root text. Later Jamyang Khyentse Wangpo was travelling in Central Tibet at the age of thirteen and had a vision of Gyalwa Longchenpa while he was in Gangri Thökar. He was blessed with the enlightened body, speech, mind, qualities and activity of Longchenpa and made the text more elaborate. A short empowerment text was composed by Dodrupchen Jikmé Trinlé Özer and later expanded by Karmapa Khakhyap Dorje. Dilgo Khyentse Rinpoche looked through the entire Longchen Nyingtik cycle in order to write an expanded version. This page was last edited on 4 September 2018, at 14:46.